Leighton Town suffered a second half collapse as they crumpled to a 4-0 defeat away to St Ives. It took the Cambridgeshire side, sat in midtable, 53 minutes to open the scoring, but made sure of victory with three more strikes as a depleted Leighton side returned home with their tail between their legs. The result leaves Town seven points above the relegation zone in 20th place. St Ives did much of the early leg work, forcing the Town back line to work hard in the opening exchanges, though they remained resolute as the scores stayed level. Town created their first opportunity on 24 minutes when the skilful Danny Watson wriggled his way into space and rattled in a shot from 25 yards that the alert Tim Trebes in the home goal did well to push away. The home side continued to force the issue, though James Hall and Scott Sinclair both came close. But while the sides went in level at the break, it took just seven second half minutes for St Ives to take the lead. Man of the Match Luke Knight rose majestically to meet Ben Seymour-Shove’s cross from the right. He powered in a bullet header from 15 yards that gave keeper Zaki Oualah no chance. With the wind in their sails, St Ives were then well on top as Leighton struggled to get a hold of the ball. 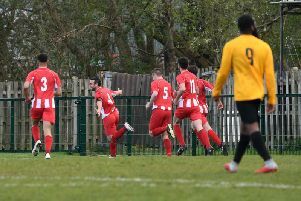 When Donik Sopa’s clumsy challenge downed Knight in the 71st minute, Jack Higgs made no mistake from the penalty spot to double the lead. Ives continued to pile the pressure on the wilting Reds and James Hall came very close to increasing the lead on 81 minutes as he fired in a fierce drive that beat the keeper and rattled the underside of the crossbar before bouncing down into the goalmouth. Eason fouled Taylor as he tried to force home the rebound. But Hall only had to wait four more minutes for his reward as Higgs played in Seymour-Shove down the right and the speedy winger unselfishly laid the ball across the six yard line to give Hall the simplest of tap ins. And three minutes later, they completed the rout as Seymour-Shove smashed home the fourth. Town take on Daventry at Bell Close next Saturday.